The project mainly aimed at raising awareness among Swiss citizens on the importance of sanitation and on the sanitation challenges both in Switzerland and at the global level. The year 2008 was declared International Year of Sanitation by the United Nations. Switzerland conducted its own Campaign aiming at raising awareness on sanitation and mobilizing additional investments for concrete sanitation improvement in developing countries. 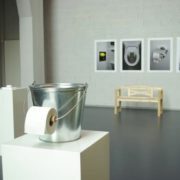 The Campaign was launched by a press conference , combined with the inauguration of an exhibition developed by design students (the designers’ view of sanitation). This was followed by a sanitation weekend (open door days in 40 wastewater treatment plants throughout the entire country), a series of sanitation events (at music/film festivals, world toilet day), and a school contest. A number of products were developed to support the various information/awareness raising actions (website, brochure, flyers, posters, presentations, etc.). About 4000 people participated in the sanitation weekend (24th/25th May 2008) and the Campaign messages were largely disseminated through the Swiss media: more than 30 articles (over one million circulation), radio and TV reports. Around 90,000 Campaign brochures were printed and distributed. The Campaign further led to increased investments (SDC, Swiss communes and private sector partners). During 2010 the Swiss Sanitation Campaign was re-launched: Skat continued to host the secretariat for the campaign; a new concept was developed, the website was up-dated and the main event of 2011, the Swiss Sanitation Day on May 21st, was organised. On that day, 59 wastewater treatment plants (WTP) across Switzerland and several towns and institutions organized open days where 16’000 people participated. A large coverage in national and local media was achieved. The post-event evaluation showed that 2/3 of the organising WTPs were very satisfied with the number of visitors and the awareness raising impact.